Customers buy this product with the Complete Medical Products Sure Suction Rail with Heavy Duty Suction, 16.5"
Helps reduce the risk of falling down or sliding while bathing and provides cushioned softness for comfort and safety. 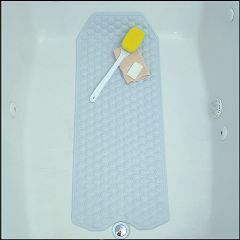 Bath Mat Measures 15-3/4" x 41"
We got this mat to help reduce slipping in our shower. Ours is a fiberglass tub enclosure with a small grid pattern in the tub floor surface. This mat would not stick to this surface. The suction cups are only installed around the edges of the mat. The mat is longer than typical tub mats. It would have been nice if the suction cups worked. It would probably stick better to a ceramic or porcelain type of surface. Had one before and this is not as good as the old one. Plenty long enough for the bath tub. Hope it will lay flater as time goes on. Very high quality at a great price. Children. Elderly. Residential. Disabled. Everyone. This bath mat is higher quality than those found in department stores with a price that is less than the department stores. It is not flimsy by any means. Allegro products exceed expectations. I always shop around and Allegro Medical has the best deals and you can trust that the products are of the highest quality. Do the suction cups actually hold the mat down well? I had 2 prior mats and the cups did not hold. No the suction cups do NOT work very well. I bought the square shaped mat -not the long one- but the suction cups seem to be holding well and the mat has not skidded once since I first started using it two months ago. Note: The floor of my shower is fitted tile squares, not a fiberglass plastic tub bottom.